For the tapenade, remove the stones from the black olives by placing them on a baking tray with another baking tray on top. Roll the top tray back and forth until the flesh separates. Place it in a food processor with the rest of the ingredients, except the lamb and the 1 tbsp of oil. Blitz together until a thick paste is formed. Place the tablespoon of oil in a frying pan over a high heat until it is smoking hot. Add the lamb and flip over every 15–20 seconds until cooked to medium rare (3–5 minutes approximately) or to your liking, before leaving it to rest for 5 minutes. Spread some of the tapenade on top of the lamb pieces and serve. Alternatively, barbecue the lamb and spoon over a dollop of tapenade while it is still warm. In the meantime, make the runner bean and radish salad. Bring a pan of salted water to the boil over a high heat. Add the beans and cook for 2 minutes, adding the radishes after 1 minute. Remove them from the boiling water and plunge them immediately into a bowl of iced water to refresh them. When cold, strain the beans and the radishes and place them in a bowl. Whisk together the oil, vinegar and mustards and pour the dressing over the beans and radishes. Mix gently and season with salt and freshly ground black pepper. 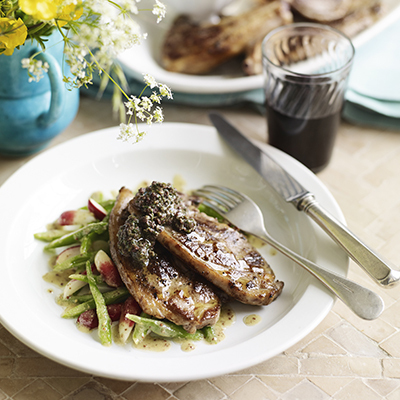 Serve the lamb with the runner bean and radish salad.